So, you’re looking for a digital camera under 100 USD? Perhaps something that’s better than your smartphone camera, but don’t quite need the quality of a professional-level product. It’s kind of hard to pick them out since the under 100 group ranges so widely. Luckily, we’ve done quite a bit of testing and research to make things easier for you! Keep reading to help you along your journey in selecting the best digital camera under 100 USD and make sure you’re getting the best bang for your buck! Before we jump into things, make sure to check out the table below, which lists each item, along with their defining features. Easily compare and contrast each camera with the others to narrow down your search before reading the fine details of each one. Now that you have an idea of which cameras are the absolute best for under 100 USD, scroll down further to read in-depth about each item you’ve got your eye on. When speaking of cameras, it’s kind of difficult to name some quality ones in the sub-100 USD category. Why? Well, smartphone cameras have almost made this category obsolete with the incredible qualities they feature. However, the Sony W800 is one of those cameras that we feel is definitely worth putting up the money for. 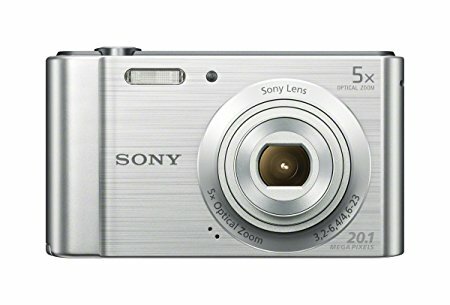 The Sony DSC W800 specs are quite impressive, even for a camera of its price range. 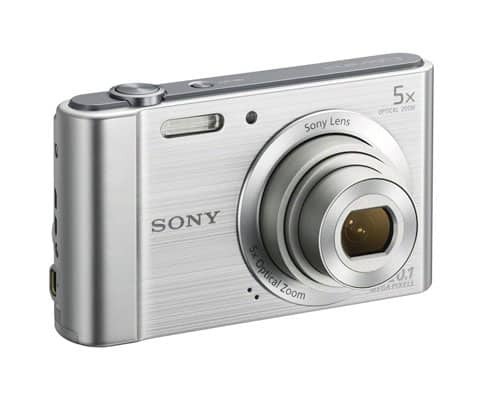 First of all, it features a 20.1 megapixel CCD sensor complete with a 5x optical zoom lens. 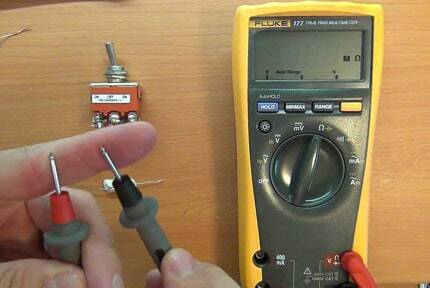 This will give you a quite clear image, and the ability to zoom in on objects without losing that crispness. Combine both of those features along with their signature SteadyShot Image stabilization technology to reduce possible blurriness. If you’re looking to also shoot video, then you’re in luck, because it shoots 720p HD video to make sure you can show off clear recordings to friends and family. In addition, it has a 360-degree Panorama mode so you can capture either video or photos from the beauty all around you. If you’ll be using this camera while traveling, then you’ll enjoy its compact size, as well as the fact that it’s so lightweight! You can simply slide it into your bag and hardly notice it’s there! You can conveniently charge it through a USB port. This means if you have your laptop you can simply plug it in there, or if in a hotel without a charger, find a USB port on the television and connect it through that. For new photographers, we understand that using features and interfaces can often be confusing. Leave the Sony DSC W800 manual at home, and instead switch over to the camera’s “Easy Mode” menu. The built-in instruction guide will also guide you through the functions if you have any doubts! While this was our all-around favorite, there were some features we’d like to point out that we weren’t huge fans of. One was the camera’s low-light performance. It’s definitely not bad, but rather just average. Another aspect was the slow shutter speed. While it does have a continuous shooting mode, the long refractory period between shots makes it somewhat obsolete. The last is that the zoom is plus and minus buttons, rather than the ring you can move back-and-forth. Are you looking for a beginner’s digital camera Target or Best Buy might have to offer but at a great price? If that’s the case, then check out the Kodak PIXPRO Friendly Zoom FZ43. It’s a camera that is not only inexpensive but will be a great camera for a beginner, without sacrificing quality. We also love this camera due to the fact that it’s just so portable. Weighing in at an impressively-light .26 pounds with the measurements coming in at 2.37 x 3.67 x 1.05 inches, it can be easily placed in a jacket pocket or backpack without adding much weight or bulk. As we did state this was a great beginner’s camera, it’s no surprise that the features are quite basic. The design and interface is straightforward, making it quite simple to use for those unaccustomed to the often-complicated interfaces cameras feature. The 2.7-inch LCD screen makes it easy to see the photos you’ve taken, as well as the menu. Featuring 4x optical zoom and 16 MP photos, you can zoom in on objects without sacrificing image quality. If you’re looking to shoot videos as well, this one features shooting in 720p HD so your videos are also clear and crisp. The 27mm wide-angle lens gives you the opportunity to simply get more from your photos without limiting yourself. If you’ll be using it in faster situations, such as in a moving vehicle, then you can choose to use the “sport” setting, however, even without it, it does a good job at eliminating blurriness. We did notice that when using the super-zoom function, things can get a bit less clear. Sure, lots of cameras can record video, but are you having troubles finding a dedicated camcorder that’s not only high quality, but also affordable? We understand, because we did, too! However, the Gongpon Camcorder Camera solved our problem! This digital video camera is compact and very well-designed, making it not only attractive to look at, but feels great to hold. It’s great for taking on trips or just short adventures, due to not only the size, but the fact that it’s so lightweight and easy to pack or carry. If you’re a vlogger or an aspiring vlogger, then this camera is perfect for you. The interface is very straightforward and easy to understand, even if you don’t have any prior experience. Not only that, but it supports webcam function! This means that you can stay in touch through Skype video calls, Whatsapp, Facebook, and more. You can also live stream to your fans and followers! The camera features 24 megapixels and takes video at full 1080p HD. 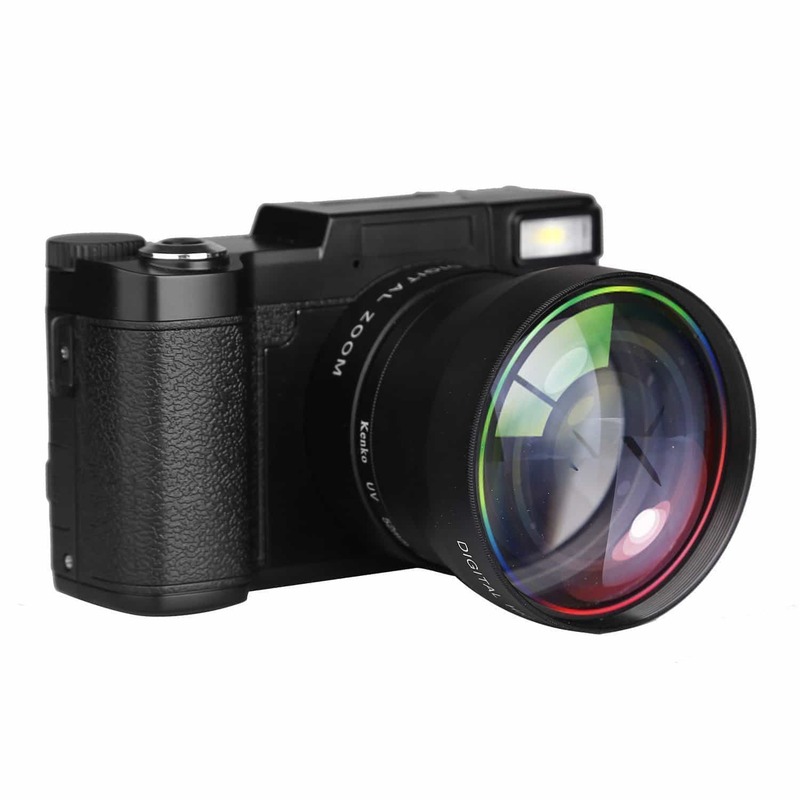 The zoom is very impressive, with 16x powerful digital zoom, and a 3” crystal screen for a clear and concise image. The screen has the ability to rotate 270 degrees give you more versatility with your shoots, especially during group shots. If you’d like, you can use a wide-angle macro lens to change up your style of videos or even use a fisheye or teleconverter lens (both are sold separately). To show off your footage, simply use the HDMI/AV output on the camera and connect to a TV to easily display audio, videos, and/or photos. To connect to your laptop or desktop computer, simply use the USB cable. This makes it easy to stream and use as a webcam, as well as download your photos, videos, and audio recordings. There were only a couple factors that we didn’t find very appealing with this best camcorder under 100 dollars. One is that the zoom isn’t very smooth. While it is effective, it does take awhile to get used to this. Another is that it does require an SD memory card to give you all of the features we have listed here. As one of the best budget cameras for travelling and adventuring, the PowerLead PLDH20 digital camera is completely waterproof, allowing for shooting both photo and video underwater up to 10 feet! If you’re planning on going to the beach and want to take some underwater scenery shots or just have fun in the pool, then this is the way to go. It’s so easy, even children are able to operate it! You’ll no longer have to worry about your kids accidentally dropping the camera in a puddle or your cup of coffee! With dual color screens (2.7” LCD in back and 1.8” TFT color in the front), you’ll be able to easily view your already-taken shots, as well as see what you’re taking in real-time in the display in the rear. It’s also compatible with only MicroSD cards but supports up to 32GB external memory cards. It, unfortunately, does not come with a memory card, so you’ll need to buy that separately. The product features a 5x zoom which is helpful but honestly doesn’t measure up to other cameras on our list in that sense. The camera comes in three attractive, outstanding colors to make sure you easily spot it: red, blue, and yellow. It’s also nice and compact while being lightweight, making it easy to take along on travels. 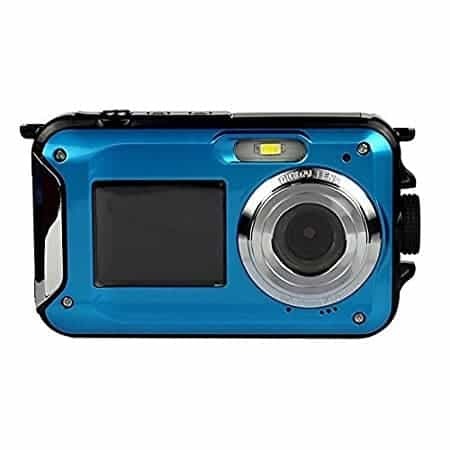 The KINGEAR KG002 is one of best cheap digital cameras under 50 USD. This makes it a wonderful option for those searching for a quality product on a budget. It can be extremely difficult to find something good for under 50 bucks, but we actually found this one to be an exception. While we did find that it’s a good budget camera, it really only features the absolute basics, such as anti-shake, face detection, smile capture, and continue shot. On top of that, it has a 2.y” TFT LCD display, along with a built-in flash. The photos can appear somewhat grainy on the screen. It comes with Pho Tags Express software to help manage as well as enhance your photos, optimizing them for prints, as well as to be sent online. Are you looking for one of the best digital cameras under 100 dollars, but with night vision capability? We’ll be honest, it wasn’t honest finding a good-quality one, but Webat has provided us with one that fits the description. The 3.0” LCD screen makes viewing your photos and previewing shots easy and convenient, as well as any photo editing you may want to do. The 8.0M CMOS Sensor and 22MP give you bright, sharp photographs, and also HD 1080p videos, should you want to film your subject as well. The built-in retractable flashlight makes it easy to highlight scenes, even when in a dark area. If you’ve never used a camera with night vision capabilities before, then prepare for your world to open up! In addition to the basic features, it also has face detection, smile capture, continuous shots, as well as anti-shake to keep your photos and videos crisp. It easily connects to USB for downloading and transferring your photos and videos! Not only is it lightweight, but it comes with a convenient bag to take it everywhere! 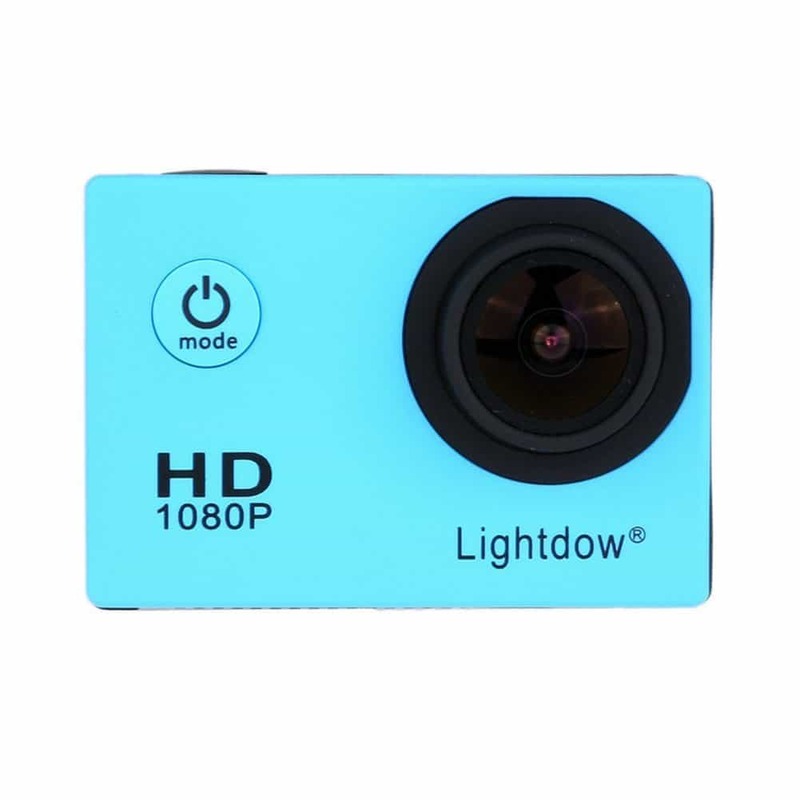 The Lightdow LD4000 Sports Action Camera is hands-down the best product to use with action sports on this list. Not only that, but it’s one of the best for those shopping on a budget. It’s one of the best digital cameras under 50 USD! The NOVATEK Original Chip provides better vision and quality, making sure that you get clear, crisp photos and video even if you’re operating at high speeds. 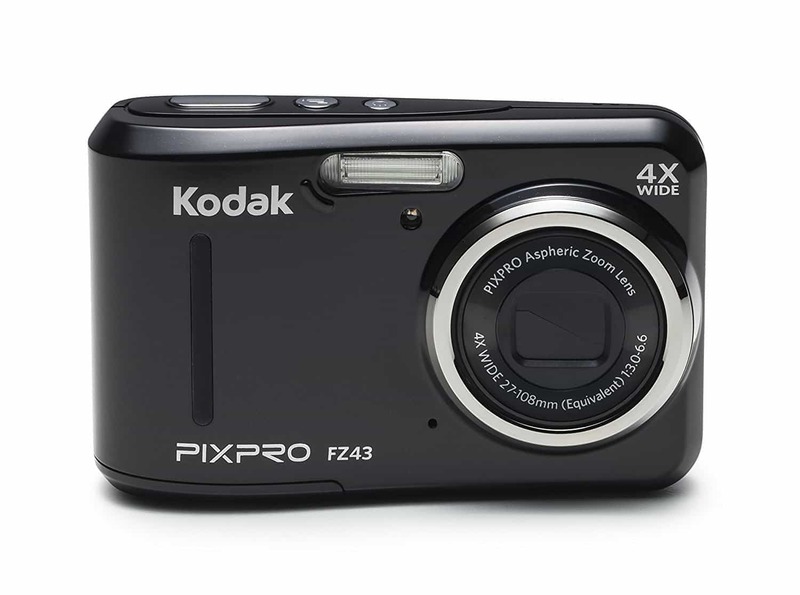 The fast, powerful shooting captures high-quality 12MP photos up to 30 fps. The camera has up to 1080p/30 and 720p/30, as well as an immersive 170-degree wide-angle lens. That’s not all; it’s also very durable and waterproof up to 98 feet (30m) which is almost unheard of, even in the sports photography world! It’s specially made to withstand extreme conditions, making it the perfect addition to not only water sports but snow sports! You can wear or mount it, allowing you to film immersive self-capture during activities such as dirt biking, snowboarding, surfing, climbing, and just about any other activity you can think of. We do have to mention that it does not come with memory, and requires a MicroSD card (up to 32GB). Whether you’re in a physical camera store or online shopping, looking for the right camera can quickly become overwhelming; especially if you’re a beginner in the photography field. Sure, a huge part of it is price, but within the sub-100 USD spectrum, things get even more tricky. We’ve created a buying guide to help lead you along the path of success and ensure that you purchase the perfect product for you and your needs. The amount of megapixels a camera’s sensor features determines just the amount of detail it’s able to capture. However, this isn’t always a good thing. If there are too many megapixels crammed into a sensor, it will mean small pixels with less surface area to capture light. This is often the case with point-and-shoot as well as smartphone cameras. This often results in the grainier photos, particularly when shooting in darker conditions without flash. So, long story somewhat-short, even 8 MP can be fine. The lens is typically known as the most important part of the camera. This goes for just about any type of camera, whether it’s a DSLR or a simple point-and-shoot. The lens is what will help capture and create crisp images in various types of conditions, whether in dim lighting or fast-moving action shots. Fast apertures (low f/stop numbers) and optical image stabilization is the combo you should be looking for. This is in most of the cameras we have on our list, and is a piece of technology which helps to reduce blur that can be caused by something simple such as your hand shaking, or sometimes even high-speed situations such as action shots in sports. Optical stabilization works because it actually shifts an element inside of the camera or lens to counteract the shake. Did you know this is in the iPhone 6s Plus?! The sensor is another very important part of the camera. It’s what converts light into electronic signals to even form the photo in the first place. Generally, the bigger the sensor is, the better the photos. Why? Bigger imaging sensors make room for an ideal combination of more megapixels along with larger pixels themselves that have the ability to capture more light. The largest sensor you’ll find in your general cameras is the “full-frame” sensor which is found in the higher-end DSLRs. APS-C sensors are a bit smaller than the full-frame and are often seen in digital SLRs, as well as select mirrorless cameras. Some other mirrorless cameras also use Micro Four Thirds sensors, which are a bit smaller even than the APS-Cs. The sensors in bridge cameras are even smaller, found in the cheapest cameras. Most cameras you find will have a feature which allows them to capture a rapid burst of photos by holding down the shutter button. This is often called “continuous shooting” or “burst” mode. The frame rate is typically measured by frames per second, or “FPS”. If you plan on shooting fast-action shots, then you’re going to want a camera with a high FPS. The ability to record HD video at 1080p used to be considered luxury, is now seen just about everywhere, including smartphones! However, there are still some cameras which don’t have them, so be on the lookout for that. Many people often are looking at the sub-100 USD range of cameras because they plan on traveling with it and don’t want to risk getting an expensive camera stolen or damaged. In this case, you’ll want to select a camera that is very portable and durable. This means something that is compact and lightweight, while still being sturdy and resistant to drops. Being resistant to extreme weather conditions and/or water is also a great feature. 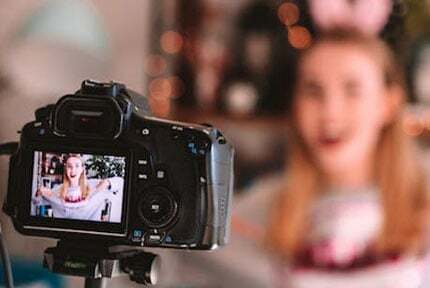 There are also extras that will be more personal to you, such as the grip of the camera if you’re a vlogger, or perhaps you want a specific color of a camera. This information is generally available in the descriptions of each product. Make sure to read each review thoroughly before you make your decision! While we really liked each one of the digital cameras we have featured on our list, we had a couple that really stood out from the crowd. The first, was the Sony W800, which is a crowd favorite for many reasons. First, it’s very lightweight and portable, making it a great travel addition without adding extra weight or bulk to your pack or jacket. It’s also very user-friendly and comes with instructions that make learning simple. If you don’t feel like going through that, simply use the “easy” mode on the menu and it’s ideal for first-time users! The 20.1MP CCD sensor is complete with a 5x optical zoom lens, ensuring that your photos are sharp and crisp, even when zoomed in. The SteadyShot image stabilization technology reduces blurriness from hands shaking or from moving in cars and action sports. If you’re shooting video, it works in 720p HD video, and has a 360-degree panorama mode! Our second favorite was the Gongpon Camcorder, which is wonderful for vloggers! First of all, it’s nice and compact, while looking nice and feeling great in your hands. It’s also easy to take on long or short trips with you without being bulky or heavy. 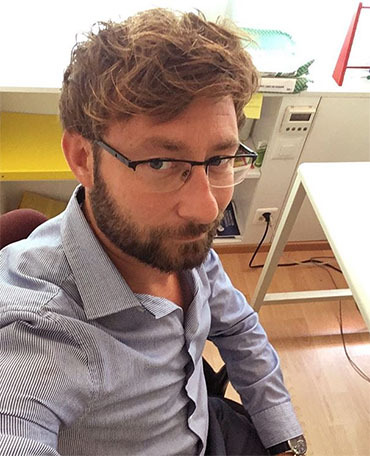 The interface is very straightforward and easy to understand, even if you’re a first-time vlogger. You can use it on Skype or Whatsapp calls, as well as use it to live stream to your viewers! It’s very easy to connect through USB to live stream or even download your videos and photos. 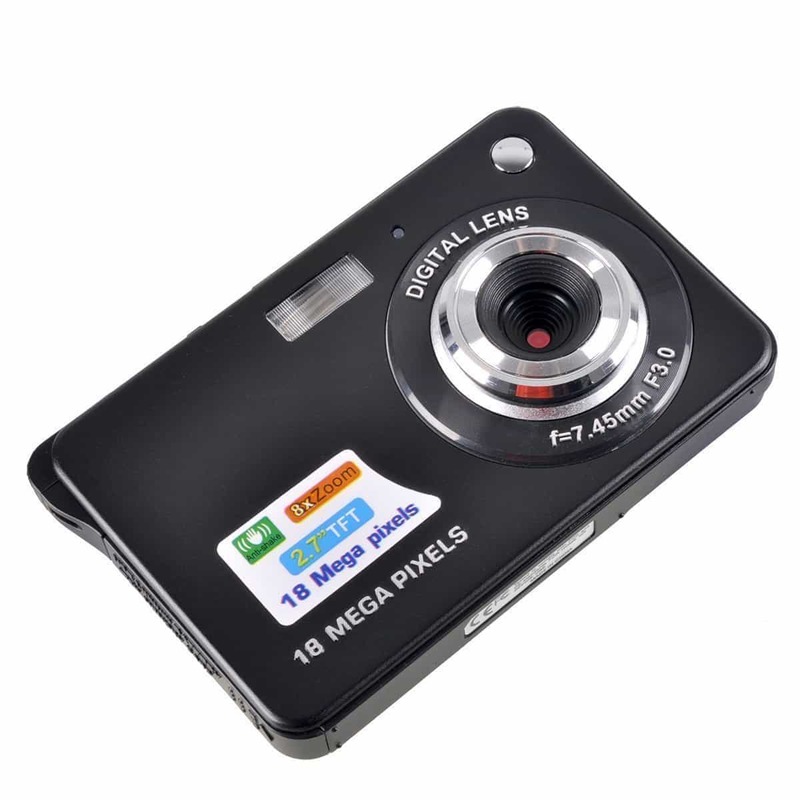 It features 24MP, with 16x powerful digital zoom. The screen rotates 270 degrees which are great for group shots. 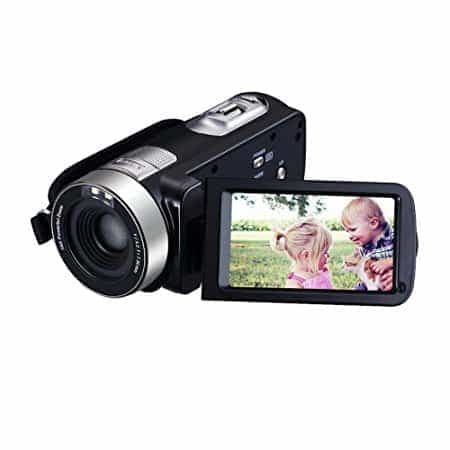 Both cameras connect very easily to charge and move over videos and photos, and with the Camcorder, you can use the HDMI/AV output to connect to a TV and display your work. Regardless which camera you choose, feel safe knowing you’ve selected one of the best digital cameras under 100 USD and get to work!